A sheer fabric is very thin material which make it very translucent. Sheer curtains are also known as privacy curtains. Sheer curtains have ‘good fall’ or very soft bearing. Some of the best sheer fabrics are of pure silk, but most of the commercial curtain materials are made of synthetic filament yarn (long length fibres) like organza, polyester, nylon, etc. Many of the lattices like airy or net-woven fabrics are so pliable, flimsy and semi-transparent that they behave like a sheer fabric curtain. A sheer fabric has a natural graceful fall and allows light to filter through. Sheer fabric curtains nominally form the first layer in multiple curtains system. 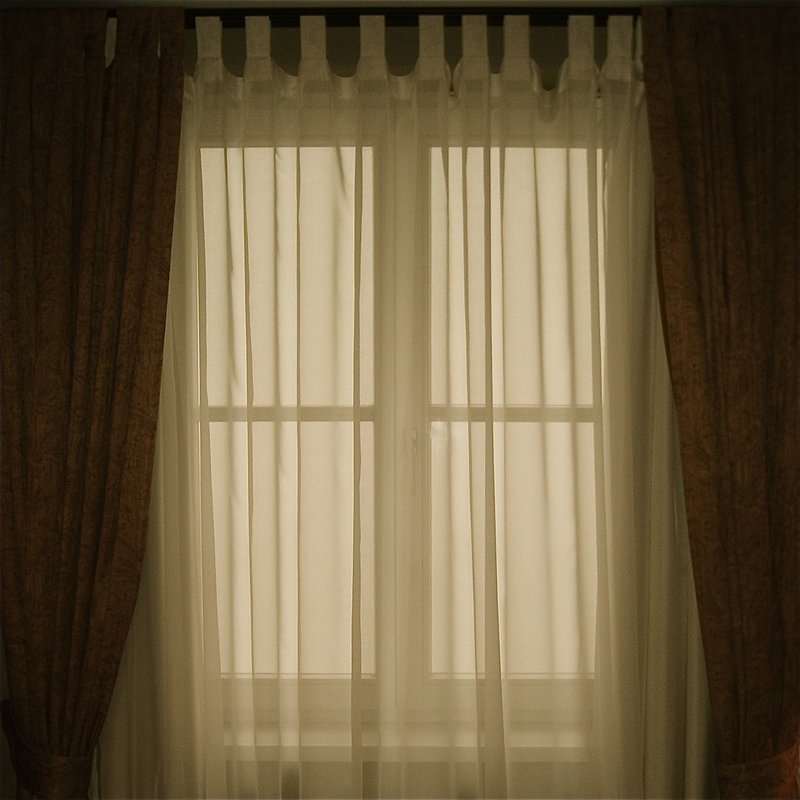 Such curtains allow a fuzzy view during day-time, but at night may require an opaque topping of a curtain. Sheer fabric must not be used with a lining fabric to maintain its translucency. Sheer fabric comes in a wide variety of colours, but white and natural shades of whites such as off-whites, cream, and ivory are popular. Sheer fabrics are also embellished and embroidered for patterns. Such extra work, however, increases the weight of the fabric at the cost of graceful fall. Sheer fabrics are commonly heavily pleated and so the total quantity of cloth required for a sheer curtain is little more then a curtain of regular fabric. Sheer fabrics, due to their thin body and the lattice like weaves, offer very little insulation. Sheer effect is due to Diffraction of Light spreading out as a result of passing through a narrow aperture or across an edge. In case of curtain fabrics sheer effects are formed by latticed or net weaving. Similar effects occur due to the fuzzy transparency of materials like glass, acrylics, etc., and also due to the environmental conditions like rains, fog, sand storms, etc. Another remarkable sheer property for curtains occurs due to the pliable nature of fabric that adds to suppleness or fall. Sudare (簾 or すだれ) are privacy and illumination filtering screens. These are sometimes called Misu (御簾 or みす). The screen are featured in The Tale of Genji. Sudare have green fabric for hem. Sudare are made of slats of wood, bamboo, and other natural materials woven with threads. These are stiff but movable panels, or rolling-folding up screens of horizontal or vertical slats.